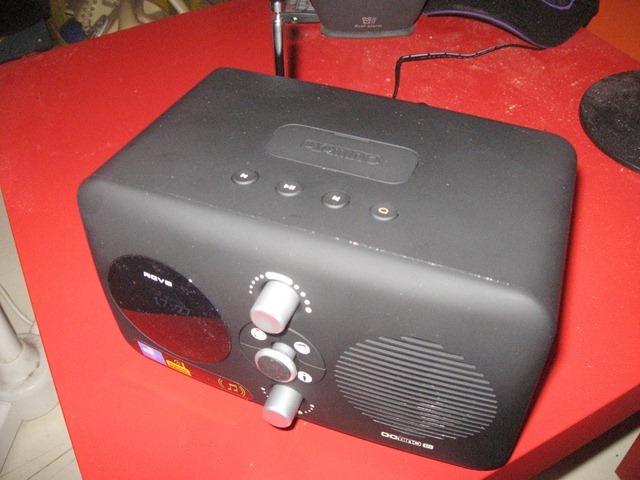 I am reviewing one of Revo’s latest Internet radios – the Domino FM/DAB+/Internet table radio which one of many of the radios appearing in this class. This set comes in a charcoal-grey rubber-textured housing, with a joystick on the front as the main selection control. 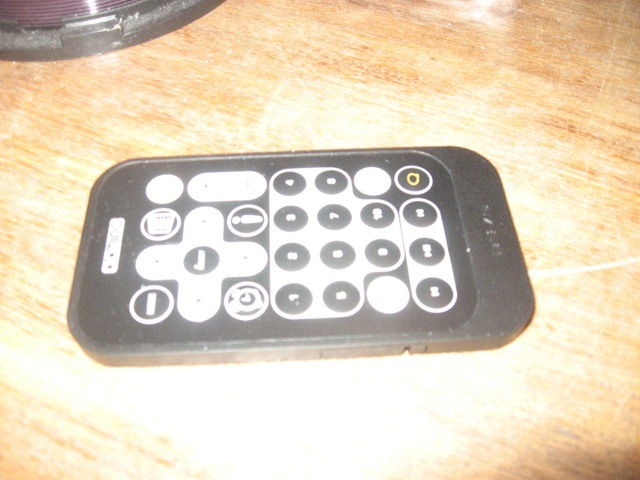 It also has a knob for selecting between operation modes and another knob to turn the volume up and down. As well, you turn the radio on and off by pressing this knob in a similar manner to most car radios. The display is in the left “porthole” on the front of the set and is a small OLED display with a similar “off-white” colour to the vacuum-fluorescent displays on most consumer electronics made by Sony and Panasonic. There is an integrated iPod dock that is covered by a removable panel and the set came with Apple-style iPod inserts that work with whichever iPod or iPhone you have. It also comes with a card-style remote control which, like its stablemate, allows for operation from a distance and allows for direct access to the locally-preset stations. 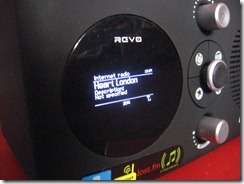 This process is similar to most Frontier-platform Internet radios like the Kogan and the Revo iBlik. The set is capable of supporting “quick-setup” with WPS “push-button-setup” routers and is the first one that I have reviewed to offer this method/ But this option isn’t made as part of the Network Setup Wizard, rather you have to go to System Settings – Network menu and select “PBC setup” to instigate this kind of setup. It is also the first Internet radio that I have reviewed that supports multiple wireless-network profiles (SSID and security-parameter combinations). 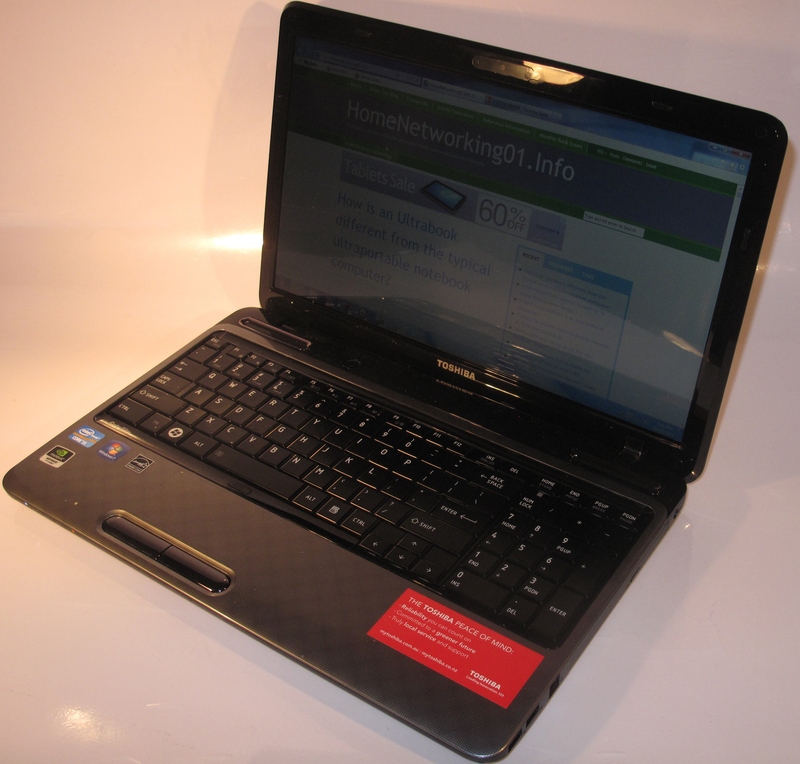 Here, this set can remember the profiles for the four last-used wireless networks but the user can delete a particular network profile from the list. It works in a manner similar to the other Internet radios that I have tried, with a “mode selector” and heavy use of menus. 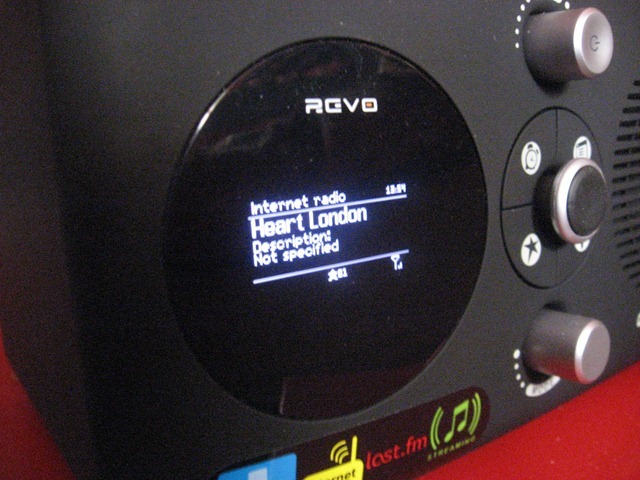 The unit also supports FM radio with RDS and DAB/DAB+ digital radio for regular RF-based radio service. The aerial for this is a telescopic rod one that is clipped vertically on the back of the unit so you don’t have to unclip it when you just need to extend it upwards. The set stores 10 preset stations for each “band” – FM, DAB and Internet radio; and you select them by pressing the star button and highlighting the station with the joystick then pressing the joystick to hear it. To set a station as a preset, you press the star button to show preset list, then hold joystick button in until “Preset saved” comes up on display. For Internet radio, this is in addition to the favourite stations that you have identified at the wifiradio-frontier.com Website. The set works properly with a UPnP AV / DLNA home media network and the transport controls on top of the set allow you to move across the music collection that you are playing. The set can work as a replacement for the old clock radio in the bedroom. The Alarm button on the front of the set is for enabling different previously-set alarm times when the set is off or to set the alarm times when the set is on. You can set two different alarm times and determine what to wake to – buzzer, FM station, DAB station, Internet station or iPod for each alarm time. Like the iBlik that I reviewed previously, you can set an alarm event to occur on a particular date, every day, every weekday or every weekend. When the alarm sounds. all the buttons on the unit reset the alarm. The joystick works as “snooze button” and repeated pressing of it allows you to extend the snooze time. There is a sleep-off timer that causes the set to stop playing after a known time. but you have to go through the menus to start the sleep timer, something you wouldn’t do if you are very tired and just want to drift off to music. There is inherent support for the last.fm “personal-music” service which can “learn” your music tastes from music played from your iPod, last.fm’s Internet radio service or a UPnP AV media server. 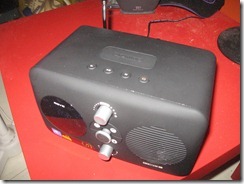 The Revo Domino is the first Internet radio that I have reviewed to have tone controls. These are found under “Equaliser” option in “System Settings” menu. There are 5 preset tone settings plus a user-determined tone setup – bass, treble and loudness-compensation. The NXT “dual-radiator” speaker allows for some “punch” in the sound without suffocating the vocals when music is played. It also reproduces speech very clearly and the set can put up a significantly loud volume without distorting. This can be of benefit if you need to use it in noisy environments. This unit has the similar output level to most radios of its kind, enough to fill a reasonably-size room with easily–identifiable music and can compete with the noise emitted by typical kitchen appliances. There are a few places where the Revo Domino could be improved. 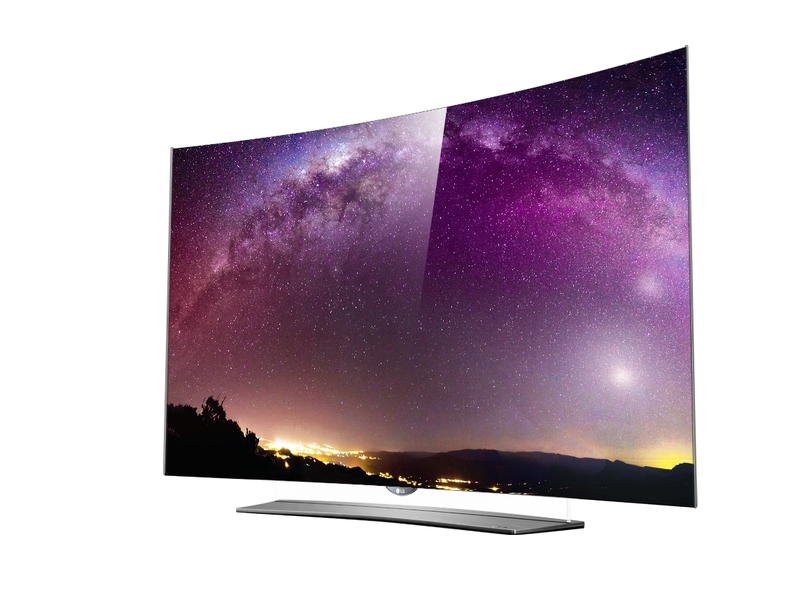 One is that the OLED display could be made a bit larger. This could improve its useability, especially if the user doesn’t have good eyesight, which may be common with senior citizens. It also could benefit from having a headphone jack installed, which can cater for late-night listening or for playing it through an active speaker system. Beyond the above-mentioned limitations associated with a small display and the lack of a headphone jack, there isn’t anything much else that I could fault this set on. Here, I would recommend that the Revo Domino be best sold as a “step-up” Internet radio / iPod-dock combination for use in the kitchen, office, workshop, or small shop. It can also work well as a clock radio even though you have to go in to the Main Menu to set the alarm or enable the sleep timer. More coverage on the VIDIPATH technology. Love the radio — agree that the LED display should be larger — even with my glasses, can’t see the time from across the room. One big drawback is that there is no backup battery in case the power goes off, which happens to me frequently. Station settings are saved, but the time and alarm settings have to be reset.